Paul works in the Clinical Science and Engineering department at Salisbury District Hospital, and has led on the research and development of FES. Functional electrical stimulation was first developed in the US in the early 1960s. It was tried with people who had strokes, and although it showed some promising results, the technique failed to get into regular clinical practice. When we started here in Salisbury, FES was seen as a research thing only. It wasn’t in regular clinical use at all. We started using FES in the mid-1980s. Originally our work was with people with spinal cord injury. We developed a range of techniques to try and help people stand and walk better. And it was from those devices that we developed the devices for multiple sclerosis. We’ve found it can be very effective. Of course it’s no cure for multiple sclerosis, but the data we’ve collected from the several hundred patients we’ve seen indicates that people’s walking ability improves significantly. They’re able to walk faster, with less effort. We have reduced trips and falls. We have two studies that show falls reduced by about 72 per cent, so people with foot drop are walking more safely. People report that they feel a lot more confident when walking. I think it’s a lot to do with the fact that they feel safer, they’re less likely to trip and carers and partners of people with MS, report that they feel more confident in leaving the person they’re caring for without assistance because they know they’re going to be safe. In our experience FES can help across a whole range of disability. Some people use FES only for longer journeys, if they’re walking long distance. The rest of the time they don’t need the extra help. And there are those that need it all the time. They might only be able to walk 10-20 metres, but that’s enough for them to get around the house, to get to the loo or get from the front door to the car. And it works for everyone in between. It is a technique you can choose to use in different ways and make it work for your own particular problems and lifestyles. Here at Salisbury we’re really very grateful to the MS Trust and its supporters. The MS Trust funded the first randomised control trials into the use of FES and has really been instrumental in getting it established in MS care. I first came across FES in 1994. At that time I was working as an outpatient neurophysiotherapist and I had been looking for ways of creating a ‘carry over’ for the treatment that I gave to people with drop foot. So I was very receptive to this idea that something could be used continuously as the patient was walking. 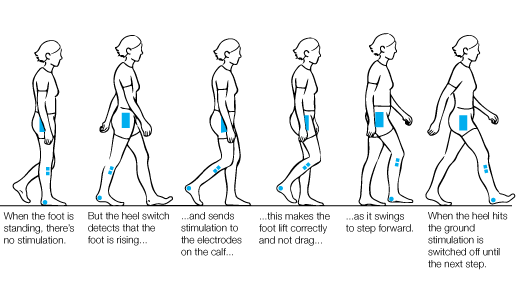 Before FES treating drop foot was was very much about my skills as a neurophysio – hands on, strengthening exercises, posture, alignment, pain management, various orthotic devices, such as splints, if appropriate. So when I discovered FES and then tried it out and saw almost immediately the benefit it had, it was my duty as a professional to make sure that people had access to it. With my experience as a clinician, and with the experience of people who used it, we were able to feed back to Paul and his team about the improvements that could make the technology even more easy to use. It was a really effective model. People took to it straight away because of the difference it made for them. The first person I saw from 20 years ago has only just stopped using the stimulator. In my clinical experience I’ve seen 845 people with MS just for FES. Of those, 327 are currently using FES at the moment. And of those 327, 123 of them are still working, and that’s really important. There is an economic benefit there, as well as everything else. I’ve recently reviewed one person with MS who has been using FES for eight years. 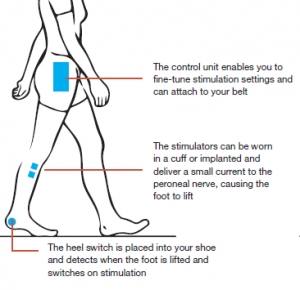 She cannot walk without the FES, but with the stimulation she can walk 10.5 metres a minute. So it’s keeping her independent. She was telling me how good it is to be able to still walk, the benefits for her digestive system, for her breathing, posture. She literally uses it from the moment she wakes up in the morning to the moment she goes to bed at night. You might say the decision to use FES for MS drop foot appears obvious but we recognise it’s not appropriate for everyone. But it has been a battle for 20 years to get the service to people with MS. On the education front: to actually let people know that it’s available. On the technical front, in the sense that it’s had to develop and improve along the way to suit various needs. And on the funding front, clearly. The biggest barrier for us has been dealing with the constant changes in the NHS. The use of FES is a great model for holistic care for people with MS. It eventually becomes an annual review: people can manage it themselves, and if they can’t, they have access to the physio team at any time. And because we see them annually, we can also signpost and deal with any other issues that they may have. And through the experience we have, we now know quite a lot about MS. I would cautiously say that we’re at the tipping point with FES now. It just feels like we’re at the point where they can’t ignore us any longer! We have enough evidence. We have good partnership with the various companies that make the stimulators. People with MS, their health professionals, the MS charities: there’s a good partnership now to push this forward. I first started experiencing drop foot about 12 years ago. I was finding I was lifting that leg from the hip: my gait was completely wrong. I was tripping over, dragging the foot. Quite often over the door step. My foot just wasn’t lifting. But I only started using FES round about August last year. I knew about FES because I was on the trial 10 or 11 years ago. It didn’t work for me then. I had been using a splint. But it was very difficult to get it on. I live by myself and I really needed help because flexing the foot to get it into the splint I found difficult. It was very uncomfortable. Last year my leg was dragging so much more and I felt I ought to do something about it. So I asked my doctor if she would refer me, and she did. The FES device takes a little bit of getting used to, getting it in the right position. But after a while it just comes naturally. I put it on first thing in the morning and usually it stays on all day. You feel there are sensations but you do get used to those. What difference has it made to me? I can walk much easier. I can walk further. I don’t drag my leg so much. I can do more with it. Stairs are easier. I have always been involved with social things anyway, but it does make it easier yes. In our local MS group people are very aware of FES. We have a weekly fitness group and there are three of us that use it. One lady particularly has a lot of trouble walking, and if she hasn’t got her FES then she is really lost. Another one wears it most of the time, another wears it occasionally if she knows she’s going to be on her feet a long time. a huge difference in keeping me mobile and making sure I can get out and see people.